We’ve taken a look at some popular celebrities in the public eye from historically to the current day to bring you a list of some of the most popular glasses wearing celebrities. In his short 22 year life, Buddy Holly made an unforgettable impression on the new music called rock ‘n’ roll in the 1950’s, but went on to influence several generations of artists including Paul McCartney, Bob Dylan, and Bruce Springsteen. Pictured wearing his big chunky plastic frames he has been quoted by John Lennon as “Making it OK to wear glasses” and also influenced Elton John to wear glasses during his performances. A founding member of the band The Beatles and a successful solo musician with such acclaimed albums as John Lennon/Plastic Ono Band and Imagine and iconic songs including “Give Peace a Chance” and “Imagine”. His round metal framed glasses are still popular today with many retailers offering Lennon ‘look-a-likes’. The John Lennon influence is as strong today as it ever was with Oasis front man Liam Gallagher idolising Lennon to the point of wearing similar glasses himself. In his four-decade career, Elton John has been one of the dominant forces in rock and popular music, especially during the 1970s. He has sold over 200 million records making him one of the most successful artists of all time. According to a recent servey carried out by Specsavers Elton John was named as Britain’s most iconic glasses wearer, admitting to buying over 20,000 pairs of glasses! Governor of the US state of Alaska and more recently John McCain’s running mate for the 2008 presidential election. Sarah caused a stir in 2008 after appearances on TV and in magazines wearing different pairs of stylish glasses including the square rimless pair displayed above right which saw members of the general public looking to buy similar Sarah Palin ‘look-a-like’ glasses. 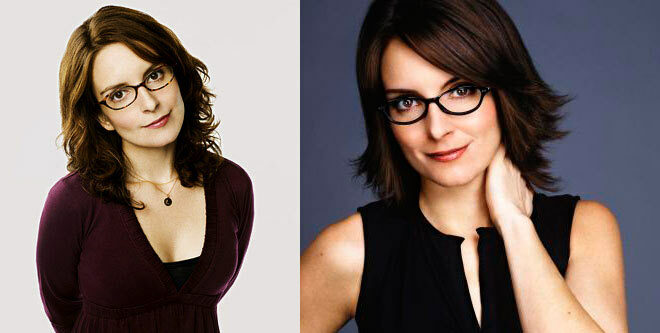 Creator and star of Emmy Award and Golden Globe winning US show 30 Rock, Tina Fey plays head writer Liz Lemon alongside Alec Baldwin for a late-night NBC comedy sketch show. 30 Rock has been a huge success Stateside and we at SelectSpecs are huge fans of the show which can currently be seen on Friday nights on Five USA (Sky channel 174 or Freeview channel 35). Tina has also starred in Mean Girls (2004) and Baby Mama (2008). Tina doesn’t necessarily wear the same glasses in everyday life, but does wear glasses of a similar theme: Plastic horn-rimmed-esque frames. Founder of software giant Microsoft and ranked as one of the world’s wealthiest people, Bill Gates has worn glasses throughout his career opting for that stereo-typical geek look in the early days with big lenses before changing his appearance with a more fashionable square-shaped, semi-rimless wire-framed pair of glasses. The star of the Pirates of the Caribbean series, Sweeney Todd, and Edward Scissorhands. 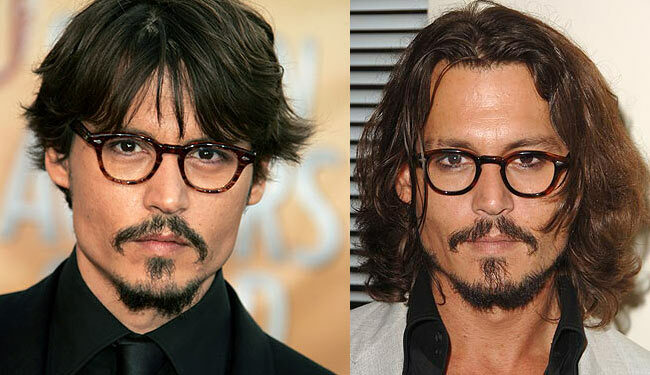 Girls love him and most men want to be him, Johnny Depp is often pictured wearing his trademark tortoise shell Horn Rimmed Glasses. These sunglasses are called Lemtosh and are made by Moscot Originals. Dennis Taylor is best known for winning the 1985 World Snooker Championship, beating Steve Davis on the final black during the 1985 World Snooker Championship final. Dennis Taylor is well known in the UK for his sense of humour and the over-sized glasses he wears while working his magic at the snooker table. Gok Wan who is well known in the world of fashion for working with celebrities including Brian Ferry and Vanessa Mae, and for his UK Channel 4 TV show “How to Look Good Naked”. Gok Wan is one of the most stylish spectacle wearers around usually choosing to wear a stylish square plastic frames. at http://www.tartoptical.com by the way Johnny Depp is known for wearing only originals or true vintage style so the ones he wears are indeed the originals that the company sold exclusively to Johnny Depp.